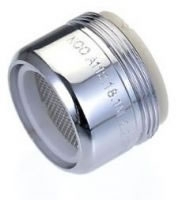 This faucet aerator limits the maximum flow rate to just 1.5 gallons per minute (measured at 80 PSI) in an even bubble spray pattern. Suitable for bathroom fixtures. Chrome plated with a solid brass body, stainless steel screen, and dual-threaded (15/16 x 27 threads outside and 55/64 x 27 threads inside) for easy installation on most faucets.